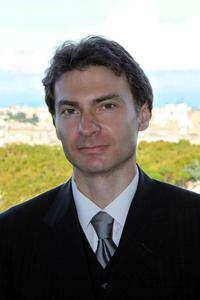 Federico Teti is currently living in New York City and he serves as Director of Music at the Lutheran Church of Our Savior in Port Washington, New York, where he plays the organ and the piano for all services, conducts and accompanies the choir, and makes music together with vocal and instrumental soloists for special celebrations. As background, Mr. Teti studied Piano, Choral Conducting, Organ and Composition in Rome at the Santa Cecilia Conservatory of Music where he graduated with the highest honors. He won the First Prize of the Competition for Young Organists “Rome 1981” and his performance given at the “Prize Winners’ Concert” was broadcasted on Italian National Radio (RAI). Since then, Mr. Teti has given solo recitals in his native Italy, the United States, Germany and Japan, and participated in Music Festivals and Competitions in Italy, France, Denmark, England, Scotland and Lithuania. Among his teachers and coaches are Daniel Roth, Ewald Kooiman, Giancarlo Parodi, Hedda Vignanelli Illy, Elio Solimini, Giorgio Carnini, Klemens Schnorr and Peter Westerbrink. He was awarded a scholarship to study at the “Accademia Musicale Chigiana” of Siena, Italy and a European Community Scholarship to study at the Academy of Italian Organ Music of Pistoia, Italy and he furthered his musical studies at the Pontifical Institute of Sacred Music in Rome, where he took courses in Organ and Gregorian Chant. An active church musician, he was organist of the Basilica of Sant’Apollinare in the historical center of Rome, where he played on an early 19th century Italian organ for the Sunday Latin Mass, enriched by the singing of a Gregorian Schola. Mr. Teti attended the Juilliard School in New York City, where he completed advanced studies in Organ Performance under the direction of Dr. John Weaver and pursued his conducting studies with Judith Clurman, Miguel Harth-Bedoya, Eduardo Browne and Isaac Karabtchevsky. While at Juilliard, he also studied Harpsichord with Lionel Party and Improvisation with Dr. Gerre Hancock. He made his Lincoln Center debut playing the Theodore Kuhn tracker organ in Alice Tully Hall and made his conducting debut at Juilliard Paul Hall, Lincoln Center, conducting the Chopin Piano Concerto No.1. Mr. Teti conducted in Alice Tully Hall, Lincoln Center, and at The Riverside Church Theatre, the Cantata for solos, choir and orchestra “The Children’s Requiem” by Judith Fleisher, and has been the conductor of the School for Strings Orchestra in New York. He has performed, among other venues, at the Cathedral of St. Patrick and at Saint Thomas Church in New York City and has given recitals in Japan at the Toyota City Concert Hall, at the Toyota Municipal Museum of Art and in Nagoya. He has also performed in a benefit concert in Japan to help people of the area stricken by the earthquake and tsunami of 2011.